There is increasing evidence that health and academic success go hand in hand. Now educators and health professionals have a new model.the Whole School, Whole Community, Whole Child (WSCC) approach.to use in promoting health and learning in the schools. This new approach, developed by leaders in education and health, is a transition from the coordinated school health (CSH) model that was introduced in 1987. Promoting Health and Academic Success is a new resource for the transition from CSH to WSCC. Written by national leaders in education and school health, some of whom were involved in the development of WSCC, this book provides direction for education and school health professionals interested in promoting student health. It is valuable for individuals and groups interested in advocating for WSCC and for those engaged in the planning, implementation, and evaluation of this new approach. ... The book is presented in five parts. Part I unveils the new WSCC model, explains its components, and provides a historical overview of coordinated school health. 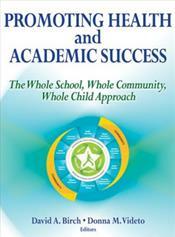 Part II offers insights into the Whole Child initiative and examines the evidence linking health and academic success. Part III explores the crucial role of school administration in ensuring success, ways to meet the diverse needs of students and their families, and methods for getting the community involved. Part IV delves into planning, implementation, and evaluation aspects of WSCC. Part V looks to the future for WSCC and provides perspectives from the field. The appendix supplies the assessment instruments and tools.